Betway Casino operates an online site through which players get access to a comprehensive range of betting options. The company is among the well-known brands in the industry. At Betway Casino, there are slots, blackjack, poker, and bingo. There's also a sports betting section covering a diverse range of sports. The casino payout percentage is very competitive and stands at over 96%. And here's our full review of this online betting house. This casino has a truly wide range of online and mobile slots. In fact, there are more than 400 of them. Whether players are looking for 3-reel, 5-reel, or more classic slots, there's plenty to choose from, including the famous Mega Moolah. This particular slot became well-known after a British soldier, busted its progressive jackpot and with that spin became very, very rich. Indeed, over £13 million (approx. $20 million) richer. The check was paid by Betway. These payouts are as real and huge as the payouts at the finest casinos in Las Vegas or Macau. The “game of 21” has been popular for ages and playing it on PCs or mobile devices doesn't make it any less appealing. At Betway, players get access to many online blackjack tables, and also can compete against dealers at a Live Casino. The gaming software is so advanced that, in many ways, the digital blackjack table looks as its physical counterparts at land-based casinos. No casino can be real without roulette. In fact, when many think of gambling, roulette wheel comes to mind. It is a game of chance, but very exciting one. Betway's online roulette wheel is equipped with many ways to bet and comes with fantastic graphics- making it look very real, even though it's a digital version. But the fun and the payouts are as real as at more traditional casinos. Poker games are there, too. Betway runs many online tournaments that poker players love so much. At Betway Casino, your poker experience will be as exciting as pretty much anywhere. 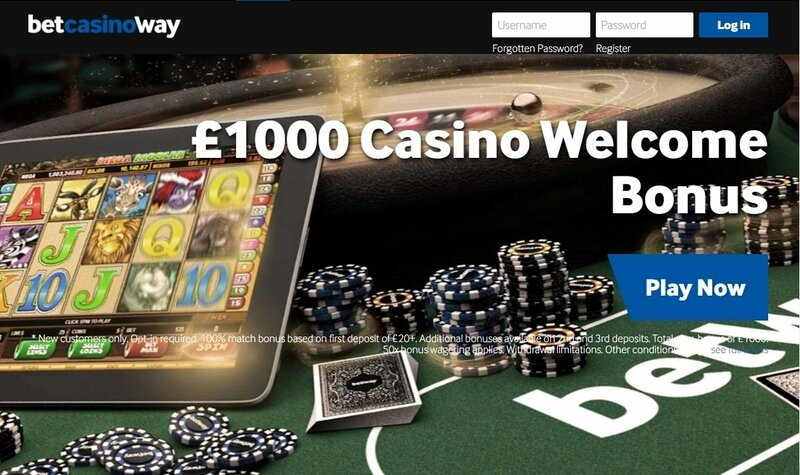 Betway is a company looking to provide the best online gaming experiences to its customers, so now there's an HD Live Casino. Live versions include roulette, blackjack, baccarat, and three different live poker versions (Casino Hold'em, Three Card Poker, and Caribbean Stud Poker). Popularity of online bingo has been growing along the popularity of online casino games. After all, with the advances of technology, a lot can now be done with PCs, Macs, tablets, and smartphones. Betway has lots of bingo on its site. There are even free bingo games daily at Let‘em Roll room where real cash prizes can be won! Two versions of bingo are available: 75-ball and 90-ball. Betway is quite distinct from many online betting sites- it offers online sports betting. Punters can now bet on a multitude of sporting events including soccer, NHL, NBA, tennis, horse racing, martial arts, cricket, handball, volleyball, and others. In-Play betting is also activated, so there's no lack of emotions and opportunities for the customers. Since the casino games, bingo, and sports betting are accessible from a single Betway platform, there's plenty of convenience for the bettors. Betway provides many bonuses and promotions. For its casino, a £1,000 Welcome Bonus is available. The way it works is that there's a 100% Match Bonus on the first deposit for up to £250, and a 20% Match Bonus for up to another £250 on a second deposit. Finally, the third deposit gets a 50% match for up to £500. These bonuses are subject to wagering requirements of 50 times. So, the players need to decide if they want to accept them. Meanwhile, the Poker room has its own bonus for up to £750. The way it is paid is by 200% match on the first deposit, also subject to limitations and other requirements. And there are also poker tournaments with cash giveaways. Coming to the Live Casino, the new customers can get £250 Bonus Chips with opt-in required as there are wagering requirements of 50 times. This bonus is also paid over the first three deposits. Now, coming to bingo, there's a 300% Match Bonus on the first deposit for up to £30. So, with initial £10, it is possible to play with £40 (subject to withdrawal limitations and opt-in). For the punters looking to bet on sports, there's a Free Bet. To get it, new customers need to make a £30 bet and then it's matched. Betway Limited is registered in Malta. For its business in the United Kingdom, the company is licensed by the UK's Gambling Commission. For outside, it has a license granted by the Malta Gaming Authority. Effectively, the company operates under permissions from two European Union countries. Betway is distinguished from some other online casinos because it is already a well-established company. The fact that is has two licenses (UK and Malta) shows this company is well-regulated to the benefit of the public. Therefore, the players can expect that they will be dealt with fairly. Betway is like a gaming supermarket- there are so many ways to bet. Huge progressive jackpots are there (as the case of a multi-million jackpot win proves), card and table games are there, too, and so is Live Casino. On top of these, sports betting, often with large potential payouts, is readily available. Speaking of payouts, at the beginning of the football season in England the odds for betting on Leicester City triumph in the Premier League were 5000-1! So the shots to win big cash are there. And Betway stands ready when it comes to honoring the commitments. The new customers don't need to join all the betting venues. For example, if you just want to play online slots, no problem. The bonus offer at Betway is generous as well, but the players need to decide how much they're willing to bet before accepting cash bonuses due to wagering requirements. Overall, Betway is a professional company and a viable place to make online bets.